Creepy Crawlies Pack – Free! A friend recently told me that her daughter was really into bugs and insects so I couldn’t resist making a pack just for her! Plus, I love this clipart from Melonheadz Illustrating. 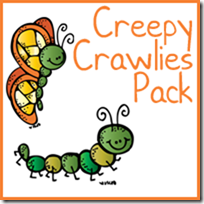 This Creepy Crawlies Pack is great for learning with bugs and insects and other creepy crawly things! I specifically didn’t call this a bug or insect pack because it includes many creatures that aren’t bugs or aren’t insects. Apparently there are strict definitions for both! But, in my opinion, they are ALL creepy crawly things. What Color is the Ladybug? Royal did a few pages from the page and really surprised me with his attentiveness. We’ve been doing addition for awhile but he gets so squirmy that we have to take a break. He worked through this sheet like a breeze though! This was the first time I had him do a measurement page and it was clear we need to do a few more. 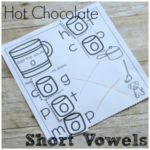 This is a learned skill – not one that comes naturally! We chose to measure in paperclips, although next time we will use small paperclips. The big ones were too big.